The time has come for a revolution in thinking about water heaters! Already in October, be ready for the market launch of the new VOLCANO mini – the first VTS Euroheat device in an innovative, polypropylene casing with exchangeable panels, the device which is not only robust and resistant to mechanical damage but also suits well the requirements of smaller facilities. Excellence and simplicity are the two main pillars that allow to predict its enormous success! For more than 24 years, the VTS Group has implemented its long-term development strategy by means of offering simple and effective, user-friendly solutions with excellent parameters. As an undisputed market leader in Poland and a key player on foreign markets, it makes a bold step forward and opens to the needs of new segments, expanding its product offer. VTS strategy provided the foundation for an idea to enlarge the product family by a new heater – VOLCANO mini. The device, which due to its unique properties, will revolutionize the market segment of smaller, local investment projects, where the power demand is between 3-20 kW. VOLCANO mini is a highly durable and robust heater with Expanded Polypropylene casing, which warrants plasticity, resistance to mechanical damage and ensures “shape memory”. 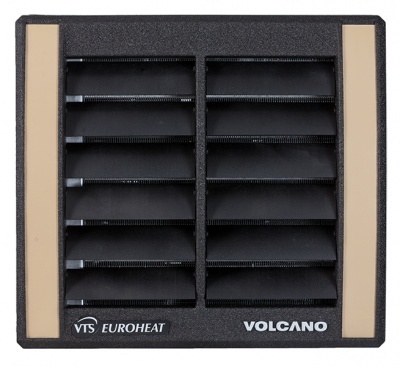 Innovative design, characteristic for the VTS Euroheat brand, has been preserved in VOLCANO MINI but this new model has been supplemented by the additional external panels in three colour combinations: classical gold of the VOLCANO family, silver and grey and bright neon red with grey rays. Further, a console has been added as a standard, in order to ensure comfortable and quick heater installation. The unprecedented design blends excellently with the technical parameters of the device, its broad range of functionalities and use as well as proven sub-assemblies. Its improved casing body ensures ideal air distribution on exchanger. Whereas, the use of thinner air guides with reduced flow resistance guarantees better air stream reach. Tenfold lighter, elastic casing, compact dimensions and quiet operation will make VOLCANO mini unrivalled in its product category. The incomparable price, lifetime casing warranty and ready availability will be the decisive factors during the selection of an optimum heater, due to which VOLCANO mini will become an integral part of numerous heating systems. Pleas look warmly at the new VOLCANO mini model at the YT channel and find out that VOLCANO mini is much more than a standard water heater.